Initially this myth holds some truth. If you're not up to speed on ways to cool your body down, you may be thinking that there is reality to this. Especially if you're one of those people whose on-board thermostat (the thyroid) just does not do well in the hot sun. But as you read on you may learn a tip or two that will actually make hot summer riding fun for you. To a degree, or should we say a few degrees, mesh gear will provide some relief from the heat. Up into the 80s for most people. But keep in mind that your thyroid is attempting to regulate your body temperature at 98.6 degrees. Riding into a wall of 90 degree plus air won't provide any cool options with which your thyroid can work with. At about 90 degrees or higher you'll need some skin surface moisture and some air. Lots of air and no skin surface moisture is a recipe for dehydration and sun stroke. But as you ride with mesh gear on your body, the air is quickly wicking away any moisture coming to the surface of the skin which will leave you dry and hot. Read on. You see it all the time, but this is a faster route to dehydration and sun stroke than number two, not to mention sun damage to your skin which you may have to deal with later in life at the skin cancer center. Keep as much of your skin covered when you ride to reduce sun damage and road rash and help stay cool. Some may ask - "How can that be?" Keep reading. Well-built textile and leather gear with good venting provides the right amount of airflow to pass over your perspiring skin and offers some natural evaporative cooling. Moisture is released through the surface of your skin and transfers excess heat away via the airflow. That's the way mother nature built the human body. With full coverage gear, you won't wick all that moisture away like you would in shorts, a t-shirt or mesh gear. But there's another way to increase your evaporative cooling ability which we will discuss in #6. Most riders that wear textile over-pants do so with a pair of pants underneath. The stuffy pair of blue jeans or otherwise can make wearing over-pants a little uncomfortable and provide too much insulation at a time when you don't want it. To remedy this, simply wear nothing but a pair of wicking skins and over-the-calf socks and notice how much more mobility you have and how much better you feel when the heat comes on. The hottest part of your body is your core. From there, main arteries head for your arms, legs and brain. Wearing a cool tie or otherwise only partially cools down the arteries going to your brain. If your core is overheated, then the blood moving to all your extremities is overheated. You need relief at the core, not the neck. 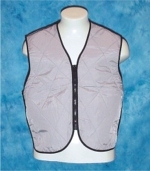 An evaporative cooling vest with a nominal amount of airflow will assist your thyroid and body with keeping your blood at a far more acceptable temperature than a wet neck tie. Your whole body will love you for it. 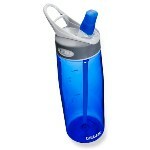 While it's true you need to keep water intake steady throughout the day, it is indeed possible to drink too much. If every time you pee, your urine is clear like water, you may have peed out all your electrolytes and you're now on the verge of the same symptoms as sun stroke bundled with organ damage. Keep the water flowing throughout the day in reasonable amounts, but refrain from drinking a few liters of water every hour. Imagine you're riding through Death Valley. It's 116 degrees and you get a flat tire. You have the tools on board to fix it but it's going to take 20-30 minutes to do so. With just a baseball cap you still have your ears and neck exposed to the sun. They look a little fogey-like but it's best to carry a full brimmed hat that was designed to be worn in hot sun. Myth #9: Gatorade and energy drinks provide the proper hydration and electrolytes my body needs to ride in the hot sun. The sport drink commercials said so. Gatorade and energy drinks are loaded with sugar and caffeine, which is essentially an oxymoronic recipe that backfires when it comes to hydration since these two ingredients promote dehydration. If you're looking to increase your intake of electrolytes, use an electrolyte additive and mix it with your water, juice, diet soda or any other beverage you like. There are various types of sunscreen on the market today. Many utilize all sorts of chemicals to block the sun's UV rays and keep the product affixed to your skin. And amidst all this chemistry lie certain ingredients that burn the eyes if they get in there via sweating or just using your finger to try and clear your eye of dirt. Look for sunscreens that have few ingredients yet yield a high SPF rating and then test a few out.